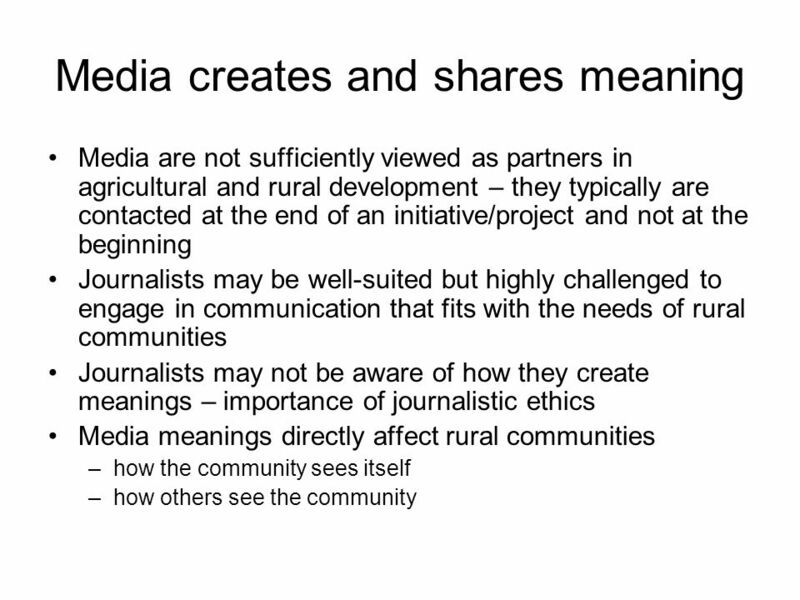 Linking media with rural communities Helen Hambly Odame Associate Professor Capacity Development and Extension Ontario Agricultural College University. 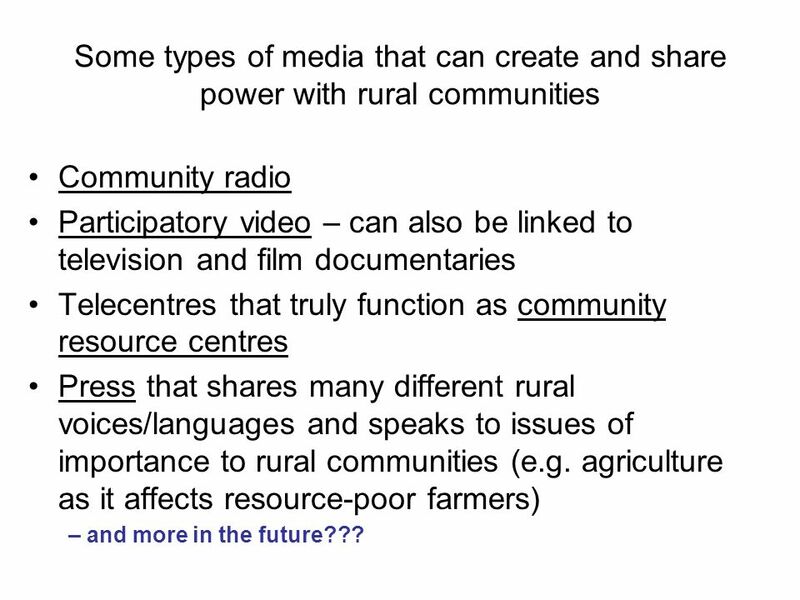 6 Some types of media that can create and share power with rural communities Community radio Participatory video – can also be linked to television and film documentaries Telecentres that truly function as community resource centres Press that shares many different rural voices/languages and speaks to issues of importance to rural communities (e.g. agriculture as it affects resource-poor farmers) – and more in the future??? 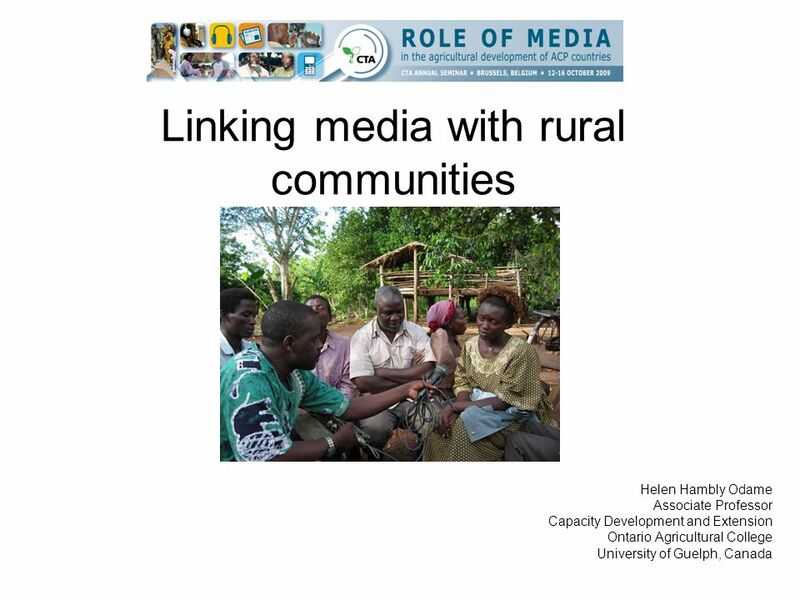 Download ppt "Linking media with rural communities Helen Hambly Odame Associate Professor Capacity Development and Extension Ontario Agricultural College University." 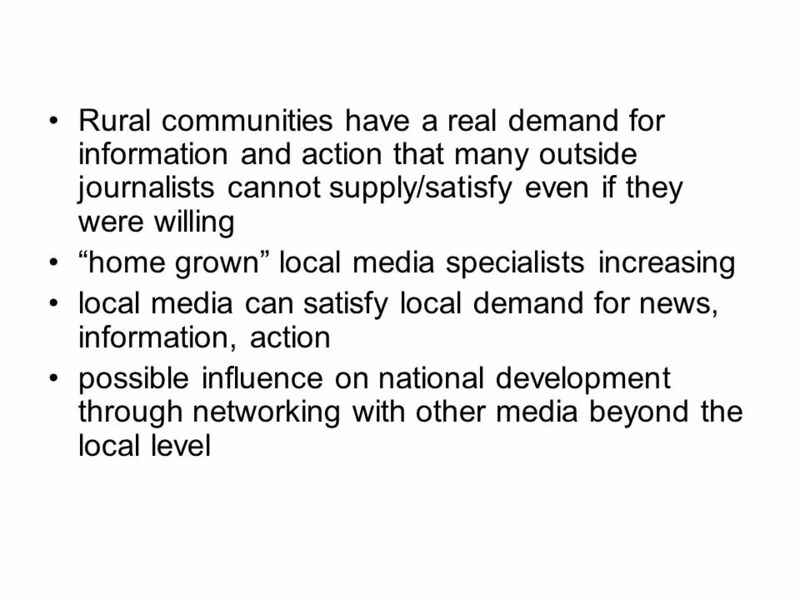 National Smallholder Farmers Association of Malawi Making the Connection: Value Chains For Transforming Smallholder Agriculture The Case of NASFAM & its. ICTs and agro-met: CTAs experience Inter-agency consultation meeting on User Interface Platform for Agriculture, Food security and water sectors of the. Making it work: co-producing impact evaluation. Professor Imogen Taylor Department of Social Work and Social Care. CSOs Engagement in National Policy Frameworks: CCCSP, Climate Financing and Information Sharing Mechanism Presented by: Cambodia team: SOU Socheath, CHEA. About Us. Centre for Community Based Research 25 years of research- inspired social innovation in Canada Over 400 community based research projects since. © 2008 MOLI, LLC. ALL RIGHTS RESERVED. MOLI ®, COVIBE TECH™, MOLI KIDS™ AND MONEY AND LIVING™ ARE TRADEMARKS OF MAINSTREAM HOLDINGS, INC. TERTIARY PRODUCTIONS. Neighbours, Friends and Families Grey Bruce Campaign November 2007 March 2008. Regional Value Chain Development and Promotion in Africa ECA-AUC-FAO An ECA Presentation at the Seventh Session of the Committee on Food Security and Sustainable. Destination Branding: Towards Destination Competitiveness Frederic Dimanche December 19, 2012. Atlantic Agriculture in a Changing Climate David Burton, Ph.D, P.Ag Climate Change Chair NSAC. 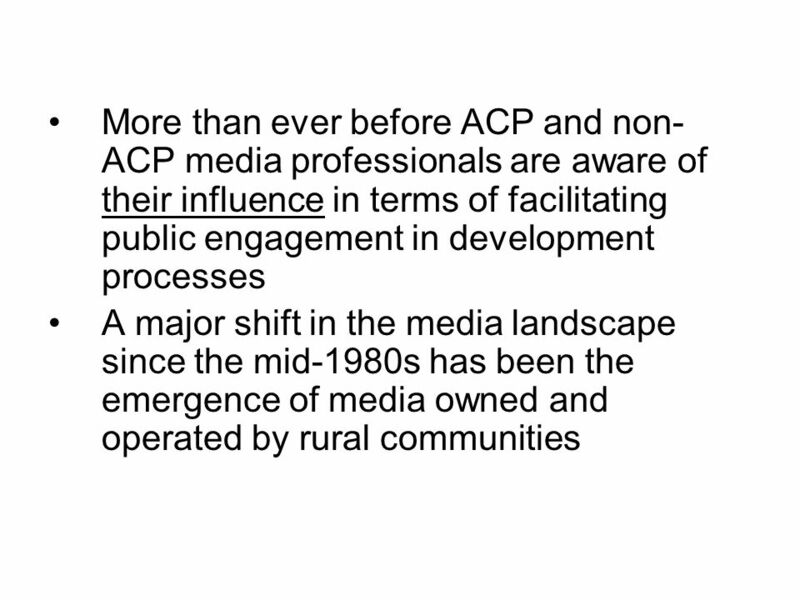 Newsrooms of today The changing landscape of media Prepared for: Public Health Executive and Administrative Assistant Conference Feb. 6, 2015 Novotel Toronto. Virginia Li - Photovoice - 10 Nov 2008 Photovoice: Beyond Visual Anthropology Caroline Wang, DrPH, Program Director Public Health Institute, Berkley, California. Use of emerging technologies in provision of Cancer Information Services: an international snap shot Dr Amanda Hordern PhD Director, Cancer Information. Stakeholders and Food Security: Managing Interfaces José Filipe Fonseca FANRPAN Policy Dialogue on Regional Strategies for Addressing the Global Food Crisis. 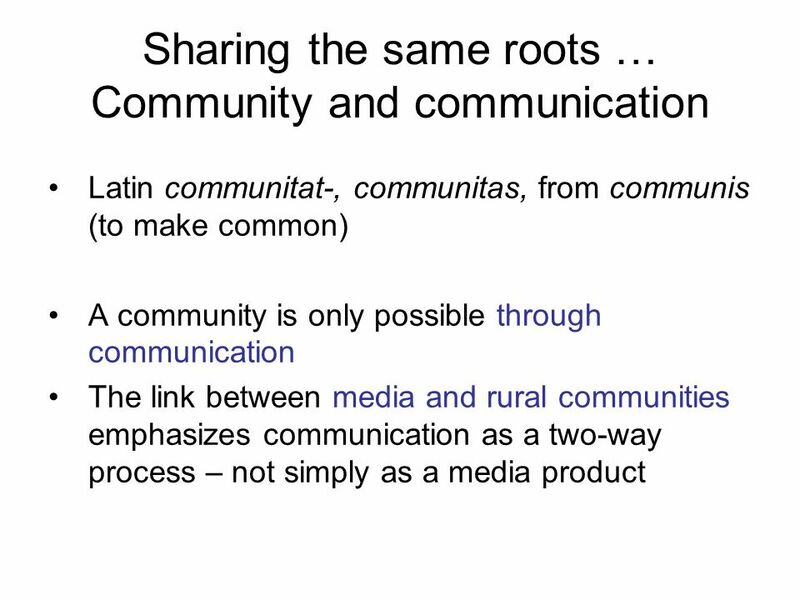 Group communication (WA). Group Communication (WA) Title: Communicating Agroclimatic Information in West Africa Goal: – Problems to be addressed: communication.